The National Theater (Nemzeti Színház) is the main as well as the largest dramatic theater not only in Budapest but also in the entire country. It is also considered to be the oldest one in Hungary as it was built in 1837. Its fancy modern building is located in Pest, in the Ferencváros district. However theater’s looks are not the only thing that makes people want to go here, its heart and soul is acting and performance. Count István Széchenyi, famous politician and writer, pioneered the idea of creating the theater. In 1836 the parliament made a decision to build it and organize a troupe, then on August 22nd, 1837 the theater was opened. Its original name, Pesti Magyar Színház, was changed in 1840 to the current one. The theater presented operas and dramas; however after the Hungarian State Opera House was built, the troupe focused only on the last ones. After a fire in 1908, it was decided to close the building due to it being unsafe and build a new theater. In 1913–1914 the construction located on the corner of Rákóczi and Antal Grassalkovich was demolished. The building plan was never implemented as the First World War broke out. That’s why the troupe moved to the National Theatre on Blaha Lujza Square. Performances had been put up here for many years until the local authorities decided to build a new subway line therefore on June 28th, 1964 the last play was performed, and after that, in 1965 the whole place was dismantled. The group worked in Petőfi Theater for two years and then in 1966 they relocated to the building on Hevesi Sándor tér where Magyar Theater used to be. Since then they began searching for a spot where a new building could be set up and even organized a contest for the best design. The process dragged on for 34 years and only on September 14th, 2000 the work had finally started. The construction by Mária Siklós’s schemes lasted for just 15 years. On 2nd January 2002, the troupe began its rehearsals and then on 15th March 2002 opened the theater to the public. The façade is designed in a quite remarkable way. The area at the entrance is shaped as ship’s prow which is surrounded by an artificially made reservoir. The theater is divided into three parts: the central building which includes main stage and auditorium; U-shaped industrial section around that stage and a park that contains plenty of sculptures and an open-air platform for performances. Its total area is 20844 square meters. Main auditorium seats 619 spectators. Auditorium of the studio theater seats 150 spectators. Size of the main auditorium: it is 24 meters in length, 17,9 meters in width and 28 meters in height. The part visible to the audience is 12 meters long and 7 meters wide. The auditorium occupies the first and second floor. The first floor also includes a checkroom and café. The studio theater called Gobbi Hilda Színpad is situated on the ground floor. The third floor comprises service rooms and Kaszás Attila Hall for small performances and conferences. The museum also owns a recording studio, a rehearsal space, a library and an archive. The last floor, the sixth one, is basically an L-shaped observation deck that offers a fascinating panoramic view of Budapest. The interior and the decoration astound and enrapture. Everything is done tastefully and lavishly. Foyer floor is embellished with glass mosaic; the halls are inlaid with gold and glass as well. Designers used as much fine natural materials as possible, these include limestone, granite, wood, wool, glass, precious metals. 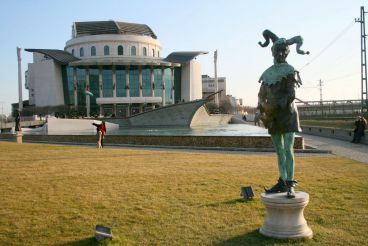 The sculptures and the garden that surrounds the National Theater are its essential parts. Everything here reflects theater's history: statues, façade design, trees, tiles. Péter Török is considered to be the creator of this beauty. You can find multiple sculptures and reliefs at the main entrance as well as on walls. Water and its mirror-like surface in front of the building symbolize the vastness of the Danube river and have a bridge built over it. The sculptures in the park were created by Miklós Melocco. A façade of the old National Theatre on Blaha Lujza Square can be seen recreated in the body of water. There is also a ziggurat, a replica of ancient Mesopotamian spiral-like towers, placed at the Danube’s bank. Exhibition halls are located within the building, right next to it – a neat and beautifully made hedge maze which children find especially fun. ferries D11, D12 that ply the Danube (Müpa - Nemzeti Színház stop). Opening hours: from 10:00 till 18:00 on weekdays, from 14:00 till 18:00 on the weekend. Lunch break lasts from 13:00 till 13:20. Telephone: (+36) 14766800. Admission: the prices depend on the play. Contact the box office: (+36) 4766868.